The MAX846A is a cost-saving multichemistry battery charger system that comes in a space-saving 16-pin QSOP. 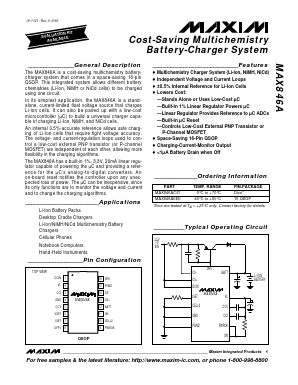 This integrated system allows different battery chemistries (Li-Ion, NiMH or NiCd cells) to be charged using one circuit. In its simplest application, the MAX846A is a stand alone, current-limited float voltage source that charges Li-Ion cells. It can also be paired up with a low-cost microcontroller (µC) to build a universal charger capable of charging Li-Ion, NiMH, and NiCd cells.